Over the past several weeks, Tax Foundation economists have published a series of studies that analyze the long-term economic and distributional effects of the tax plans outlined by President Barack Obama and Governor Mitt Romney. These comprehensive assessments were done using the Tax Foundation’s Tax Simulation and Macroeconomic Model which measures how changes in tax policies affect the economic levers that determine economic growth, workers’ incomes, and the distribution of the tax burden. Table 1 and Figure 1, below, compare the model’s key economic results for each of the candidates’ main plans. For the sake of simplicity, the results shown here for Governor Romney’s plan do not include the deduction caps (17 and 25 percent) Romney recently floated. We have analyzed their effects separately. The results shown here for Obama’s plan do not include his corporate tax proposals (because the lack of specificity made modeling them difficult) or the new taxes contained in the Affordable Care Act (ACA). However, we did model these taxes separately. As the table indicates, the candidates’ tax plans would have a starkly different impact on the economy. The Romney plan, which would reduce tax rates on individuals and corporations, would increase GDP 7.4 percent over the long run. The Obama plan, which would raise tax rates on individuals, would reduce GDP 2.9 percent over the long run. These very different futures are the direct consequence of the candidates’ very different approaches to taxing the inputs of production, i.e., capital and labor. Obama would raise taxes on investors, which would reduce the capital stock by 7.5 percent. Romney would reduce taxes on investors, which would increase the capital stock by 18.6 percent. Obama would raise taxes on labor, which would reduce the wage rate by 2.3 percent and hours worked by 0.7 percent. Romney would reduce taxes on labor, which would increase the wage rate by 4.7 percent and hours worked by 2.9 percent. However, Obama’s plan does raise more tax revenue, even after accounting for macroeconomic affects. Obama’s plan would raise $41 billion while Romney’s plan would lose $136 billion (without including any unspecified tax offsets such as the 17 percent deduction cap). But the larger question is at what cost to the economy? Our analysis indicates that for every dollar of tax revenue raised under the Obama plan, the economy loses $10. Under Romney’s plan, for every dollar of tax revenue lost, the economy gains $8. Lawmakers and citizens have important choices to make in terms of how best to fund the federal government in a way that does not do excessive damage to the economy. Our analysis shows that the president’s proposed mix of higher income tax rates generates more revenue but at a steep cost in terms of private sector employment and incomes. There are more economically friendly ways to raise revenue that do not put so much of the burden on investors and workers. A more evenly distributed tax burden, one that taxes consumption today and tomorrow at the same rate, will generate more economic growth and ultimately more sustainable government finances. Note: All dollar figures are in billions of 2008 dollars. These changes represent the cumulative increase or decrease in the permanent level of GDP and other variables after all economic adjustments to the tax changes, taking five to ten years. They are not permanent changes in the annual rates of growth of the variables. The economic model and tax calculator were run at 2008 income levels, and dollar figures are in 2008 dollars. 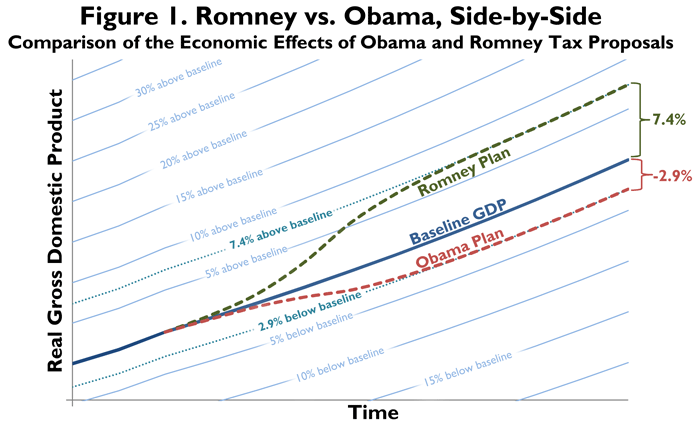 Romney’s plan was modeled according to the candidate’s specified rate structure, including reduced rates on individuals and corporations, but not his unspecified proposals to reduce tax expenditures. See our earlier report for specifics. Obama’s plan was modeled according to his proposed rate structure as presented in the 2013 Federal Budget, including higher rates on individuals and estates. It does not include Obama’s corporate proposals contained in the February White House/Treasury Framework for Business Tax Reform, which suggests a lower corporate rate of 28 percent combined with a number of revenue raisers that largely offset the rate cut. *Private business sector equipment, plant, other buildings and structures, inventory, etc. **Percent of static tax cut recovered (+) due to faster economic growth, or percent of static tax increase lost (-) due to slower economic growth. ***Positive numbers indicate that the government would lose revenue with these cuts, but that economic output (GDP) would rise by the indicated amount for each dollar of revenue lost. Oppositely, negative numbers indicate that GDP would decrease by the indicated amount for each dollar of revenue raised.